My Space, My Style is back after a bit of a break and I'm really excited to be sharing this amazing space with you. 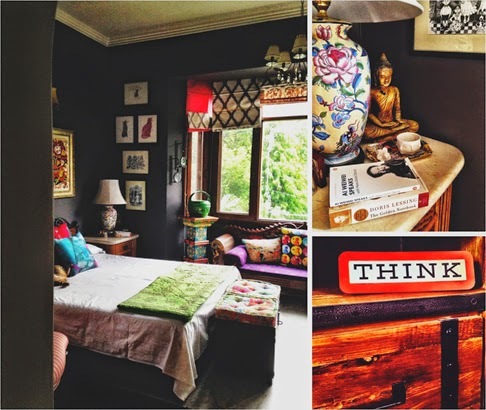 Aradhana wrote in to to me last month asking if I'd feature her room and I was just blown away by the space she has created. 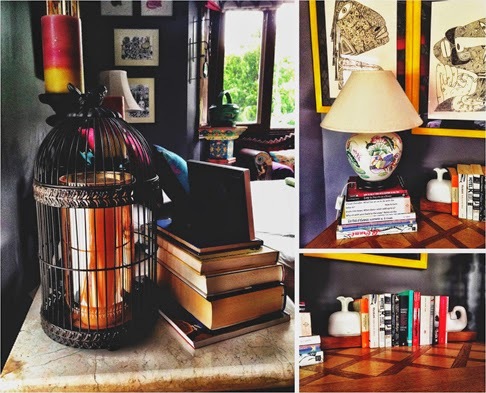 After dividing the last twelve years of her life between between Delhi, Dubai and finally Singapore, Aradhana has returned to Delhi temporarily, and here's how she describes her desire for her own space- "I've always wanted a space, any space, a room, an entire apartment, a house, to be like a reflection of myself. A place I come back to after a long day; home. " I definitely think she has succeeded! Her room is a beautiful amalgamation of the exotic Orient and Indian chic; what an incredible place to escape to at the end of the day ! Aradhana has always been obsessed by dark colors and after a lot of experiments, finally settled on a beautiful charcoal black for the walls of her room. The choice of color for the walls was also important because the walls would be playing host to all the art work, knick knacks and memories that she has collected on her travels. I love the way Aradhana has mixed and matched different styles of furniture, as well as introducing a pop of color here and there to brighten up the dark walls and add interest. 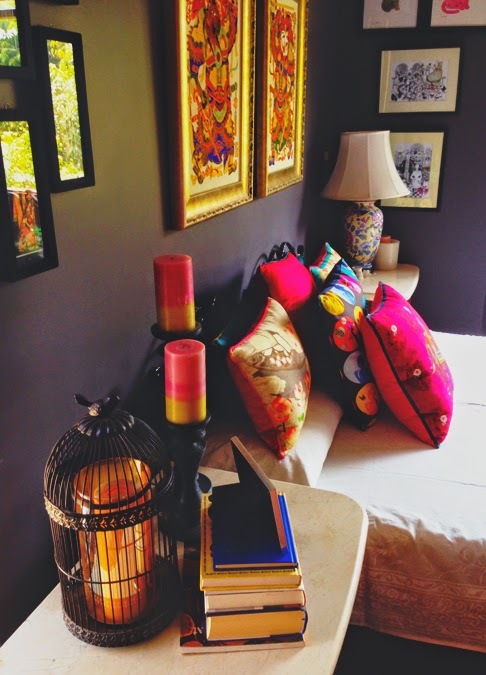 To read more about Aradhana's room story, drop into her lovely blog. Great post, thank you so much! Appreciate it. It was a real pleasure Aradhana... Thanks for sharing! Bold statement of a home, loved the tour! Love the dark walls offset by the colorful knick knacks, artwork on the walls, and the greens outside. Aradhanas style is a pleasant departure from the usual Indian decorating trends, thanks to both of you for this tour! Couldn't agree with you more Ambika... very different and so nicely done! Lovely home,ethnic & chic ! Never thought black walls would look so gorgeous. Vow! Charcoal is a bold choice! Looks like she knew what she wanted from the word go - very well pulled together. Kudos to her keen aesthetic! Welcome to All Things Nice! Please stay a while :) This little blog is where I share design stories, home tours and my love affair with food & travel. Get Featured in My Space, My Style! You can feature your home, or a space in your home here on the blog. There are just two conditions- the space must be designed or styled by you and it needs to be fabulous! Some Weekend Fun with Mango Margaritas!